If you are looking for the opportunity to escape and explore for longer than a single day, the pristine waters of Clayoquot Sound are the place to be. Designed around marine conditions and guest preferences our multi-day tour takes you into Southern Clayoquot Sound to the shores of Vargas Island. Vargas Island offers a rugged shoreline, sandy beaches, sheltered channels, a lagoon and mudflats to explore. Explore the coastline searching for wildlife, big and small. Camp beneath the stars or the canopy of the rainforest. Eat delicious, nutritious and fresh meals inspired by the West Coast and prepared by your guide. Watch the sunset as you fall asleep to the sound of gently crashing waves. Wake up as the sunrises over the mountains of Vancouver Island. Escape from the routines of every day life and live simply by the tides. The shores of Vargas Island are a popular place for grey whales to feed and nearby is the Cleland Island Ecological Reserve which is home to a variety of nesting birds including the Rhinoceros auklet, Pigeon guillemot and plenty of Black oystercatchers. Transient Orcas and the Humpback whale are known to use the waters off of Vargas Island as feeding grounds in the summer as well. Land loving mammals like the black bear and the coastal wolf are also scattered around Southern Clayoquot Sound. The opportunities for wildlife on and around Vargas Island are vast. ***If these dates do not fit your schedule, please contact us about custom dates. Paddle West Kayaking currently offers a 3 day, 2 night tour. The tour begins, unless otherwise specified, on Friday at 8:00am and ends on Sunday between 12:00pm and 3:00pm (weather dependent). All tours begin and end in Tofino, British Columbia on our docks at Jamie’s Whaling Station. It is recommended to arrive at least one day prior to the beginning of the tour. This will allow you to meet your guide and to pack so you are ready to paddle away the following morning. Knowing how beautiful Tofino, Ucluelet and the surrounding area is we suggest that you plan to stay and explore once your tour ends. The guide in the kitchen! Our multi-day tour requires no previous paddling experience but we suggest that you be familiar with camping in a wilderness setting. It is also recommended that you have the physical ability to sit in a kayak and paddle for four to six hours a day. The paddling is often not strenuous but depending on conditions more physical exertion may be required. The tour and the destination campsites will be determined by the group’s experience and abilities. 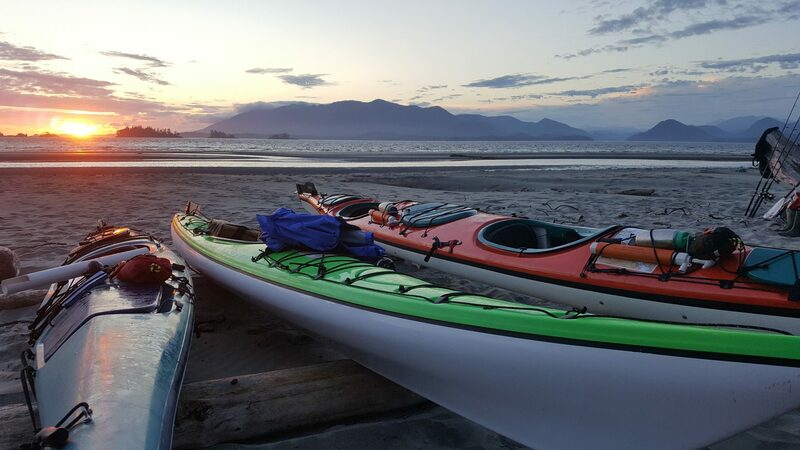 Paddle West Kayaking provides all the kayaking and safety gear required for the tour, your guide, wilderness camping fees and West Coast inspired meals. You are responsible for providing your own camping set up which includes a tent, sleeping bag and sleeping pad, personal clothing and other personal items. If you do not have your own camping set up, Paddle West Kayaking rents such items for a reasonable extra cost. Please see the Packing List page for a detailed list of what to bring with you on your tour. All guests are required to fill out a medical form and sign a waiver document prior to leaving on the tour.